Say hello to the all new IceCube Blog Theme, we are releasing our brand new IceCube Blog WordPress theme for blogging. After a series of tests and enhancements, the theme is finally available on the web. IceCube Blog is a Bootstrap based responsive and clean wordpress theme for blogging with masonry layout. IceCube wordpress theme is a good choice for your personal as well as business blog. The theme comes with bigger featured images, animated navigation, social media icons, beautiful author box and integrated theme settings panel to customize it as per your needs. 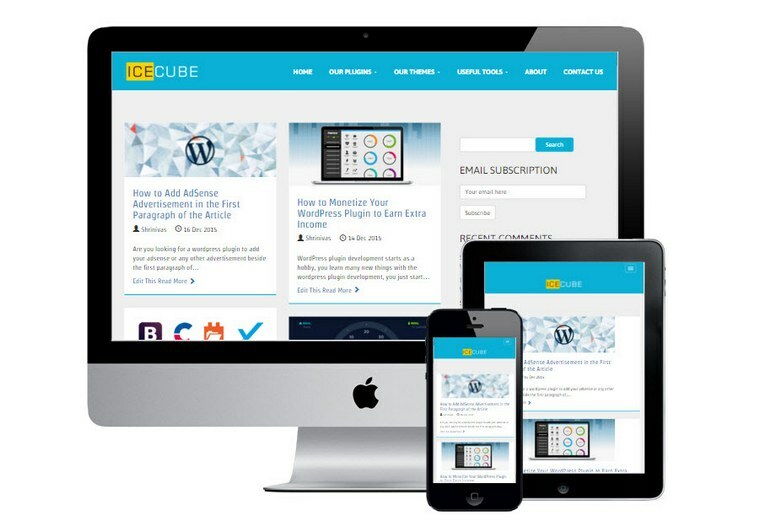 Below are the features of our all new IceCube Blog wordpress theme. IceCube Blog is a minimal responsive wordpress theme that works well with mobile, tablet and PC. The theme uses masonry layout for an elegant look. This wordpress theme comes with a sidebar and 3 widgets at the footer area, the integrated settings panel, social media icons. The theme boasts better typography, beautiful author box and auto collapsing navigation for better readability and smooth scrolling effect. Speed is the most important factor in blogging and this theme is built keeping speed and simplicity in mind. The more simple the layout, the less it takes the time to load. Check out the IceCube Blog theme homepage for more information and download link. I appreciate you article. You have discussed here some major points what bloggers search before installing a theme. I will bookmark your article and suggest this article to other bloggers who are searching good theme. Thanks so much sharing this article. Hi Moumita, thank you for your words.